A South Tyneside riverside attraction has scooped a prestigious national award. Harton Quays Park on South Shields riverside has been recognised for its magnificent soft landscaping. 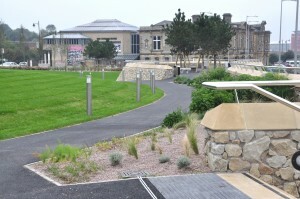 The stunning waterfront attraction was the only scheme in the region to win a British Association of Landscape Industries award. Councillor John Anglin, Lead Member for Regeneration and Economy, said: “We’re thrilled that Harton Quays Park has received yet another accolade. “This is just one of our exciting regeneration projects which are breathing new life into the Borough. We are developing spaces that we can be proud of and creating a legacy for future generations. “The park has completely transformed the riverside and it’s fantastic that it is getting well-deserved recognition from industry professionals. The park, officially opened by TV broadcaster Julia Bradbury last November, was created on former derelict coal staithes stretching from South Shields ferry landing to the Customs House. It features a curved stone ribbon wall, promenade, striking water feature, garden seating areas, a dramatic ‘pine grove’ viewing point across the river and an amphitheatre to host public performances. Joe Zazzetta (ok), Director of Sustain Landscapes, which installed the soft landscaping features of the park, said: “Harton Quays Park is the first scheme we have entered for a BALI Award and we are absolutely delighted to be announced as a winner. “Harton Quays Park has an unusual planting scheme which was both challenging to source and also to install successfully as much of the construction took place during very hot, dry conditions. I am proud of all the team. Harton Quays Park is a key part of the wider regeneration of South Shields, which aims to improve the connectivity of the town centre, riverside and seafront areas. It was crowned winner in the ‘soft landscape construction’ category, and the award will be presented at a glittering ceremony at the Grosvenor House hotel, London in December. It is the latest in a string of awards and commendations achieved by the park, which was jointly funded by South Tyneside Council and the Homes and Communities Agency and delivered in partnership with landscape architects Grant Associates and contractor Balfour Beatty. In 2013 the park received a ‘Very Good’ commendation as part of a CEEQUAL Client and Design Award. And earlier this year it was highly commended in the Regeneration category of the Royal Institute of Chartered Surveyors North East Renaissance Awards. The BALI awards have been held annually since 1976 to celebrate excellence in landscape design, construction and maintenance.